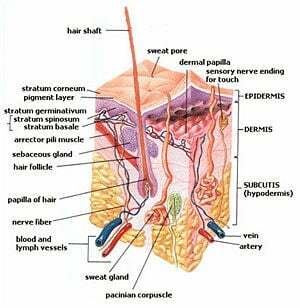 Skin layers: epidermis, dermis, and subcutis, showing a hair follicle, sweat gland, and sebaceous gland. The integumentary system is the external covering of the chordate body, comprising the skin, its pigments, and various exocrine glands that produce sweat, tears, sebum and other oils, mucous, waxes, scents, and milk. It also includes all derived structures such as hair, feathers, scales, teeth, baleen, nails, claws, horns, beaks, and hooves. The word integument is derived from the Latin word integumentum, which means "a covering." The skin allows the expression of the invisible mind of a person, as seen in the voluntary movement of the facial skin, which is capable of expressing an infinite variety of moods and emotions, all based on the subtle movement of skin cells from one location to another. The integumentary system is often considered to be a single organ system and as such it has the largest surface area of all the organ systems. In human beings, it amounts to about 16 percent of the body weight. It is composed of many types of tissue, including epithelial, connective, neural, and muscular. This organ system, composed of many diverse cells and tissues, provides a wall of defense between the body and the environment. These integumentary cells are the most vulnerable of all the bodily cells to death and destruction. The epidermal epithelial cells are replaced every ten to 30 days. The wound healing system of the human skin is a remarkable feat of intercellular cooperation that continues to mystify medical researchers. The integumentary system serves multiple functions in promoting homeostasis of the body. The cutaneous layer or skin is composed of two layers of tissue: the epidermis and the dermis. The epidermis is an epithelial tissue and the dermis that supports it from below is a connective tissue. Beneath the dermis is a loose connective tissue called the hypodermis or subcutaneous layer. Mammary glands - milk-producing glands located in the breasts. The epidermis is the outermost layer of skin that varies in thickness (in people) from 0.07 to 0.12 millimeters (mm). The palms of the hands average about 0.8 mm and the soles of the feet have a thickness of about 1.4 mm (Bloom et al. 1975). Its microscopic appearance is that of a keratinized stratified squamous epithelium. The epidermis is derived from two different cell lineages. The first lineage is derived from ectoderm and forms the progressively keratinizing layers. The second lineage is from the neural crest which forms the melanocytes or pigmentary system of the skin. There are two other cell types, which are neither keratinizing nor pigmentary: Langerhans cell and Merkel cells. The cells in the deepest layer, the stratum germinativum, begin as cuboidal cells engaged actively in mitosis. As more cells are produced, the older cells move upward to another layer. When they reach the stratum spinosum layer, the cells become flattened and polyhedral. They develop an elongated nucleus and each appears to have "spines." These spiny processes meet to form desmosomes. This layer is stained darkly with basic dyes. Once they become part of the stratum granulosum, they form three to five layers of flattened cells, which now contain many irregularly shaped granules of keratohyalin. As they move upward into the stratum lucidum, they become more flattened and develop an affinity for acidic dyes like eosin. At this stage, they lose their nucleus. This layer is only evident in the soles and palms. In the top layer, the stratum corneum, the cells have become heavily cornified and most of the cytoplasm has been replaced with keratin. These lifeless cells are very tightly packed and the outermost layer is sloughed off to the environment. This layer is sometimes referred to as the stratum disjunctum. This entire life course of the skin cells from the stratum germinativum until they are exfoliated and leave the body in the stratum disjunctum takes about 15 to 30 days. As the cells age, they become filled with keratin and they lose their nuclei and all organelles until they are shed as lifeless shells (Bloom et al. 1975). Upper Papillary layer: Contains touch and pain receptors, which communicate with the central nervous system, and this layer is responsible for the folds of the fingerprints. It is a loose connective tissue. Lower Reticular layer: Made of dense elastic fibers that house the hair follicles, nerves, and glands. It is a dense connective tissue with many bundles of collagenous fibers running parallel to the skin surface. There are smooth muscle cells, the arrector pili, associated with hair shafts, and many voluntary muscle cells to control facial expressions. The differences in skin color between various people is due to one type of cell, the melanocyte. The number of melanocytes in human skin is believed to be the same for all people. However, the amount of pigment, or melanin, within the melanocytes is different. People with black skin have the most pigment and people with white skin have the least amount of pigment ( Astner and Anderson 2004). The skin or integumentary organ is a wonderful example of many cell types working in harmony and providing a value for the benefit of the whole body. None of the various skin cells discriminate against each other. If they did, the body would suffer. If the skin failed to perform its expected functions or stopped working in any way other than at an optimum level, the entire body of trillions of cells would be in danger. Astner, S. and R. R. Anderson. 2004. Skin phototypes 2003 Journal of Investigative Dermatology 122. Retrieved January 26, 2008. Bloom, W. and D. W. Fawcett. 1975. A Textbook of Histology, 10th edition. Philadelphia, Pa.: W.B.Saunders Company. ISBN 0721617573. Kardong, K. V. 1998. Vertebrates: Comparative Anatomy, Function, Evolution, 2nd edition. New York, NY: McGraw-Hill. ISBN 007115356X. This page was last modified on 2 April 2008, at 09:31.